When you subscribe to Two Lines, a biannual journal of international literature to which The Paris Review offered a “hearty congratulations,” you are celebrating and supporting international literature in translation. 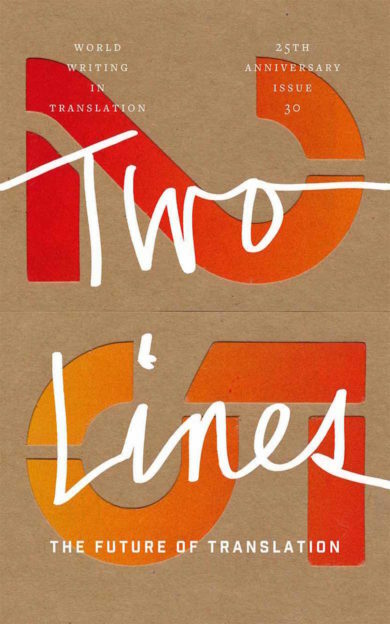 Two Lines amplifies the aims of Two Lines Press by capturing the most exciting work being done today by the world’s best translators—and by forging a space to celebrate the art of translation. Within our pages you’ll find work by writers such as Yuri Herrera, Kim Hyesoon, Christos Ikonomou, Rabee Jaber, Emmanuel Moses, Anne Parian, Chika Sagawa, Enrique Vila-Matas, and Jan Wagner—in translations by Lisa Dillman, Don Mee Choi, Karen Emmerich, Kareem Abu-Zeid, Marilyn Hacker, Emma Ramadan, Sawako Nakayasu, Margaret Jull Costa, and David Keplinger, respectively. You’ll also encounter arresting insights on language, literature, and translation from the point of view of writers such as Lydia Davis, Johannes Göransson, Wayne Miller, and Jeffrey Yang.